Toledo Lucas County Public Library is a public library system located in Toledo, Ohio. Founded in December 1838, it was Ohio's first public library created with tax money. There were sixty-six charter members in the association's subscription library. Members paid a annual fee of two dollars. The Ohio General Assembly granted a charter to the Young Men's Association of Toledo for a "lyceum and public library." In 1864, Republican members broke off from the Young Men's Association Library and formed the Toledo Library Association. In 1867, the two groups merged. In 1873, a free public library was organized by an act of the Ohio Legislature. On May 26, City Council passed a resolution creating The Toledo Public Library. Mrs. Anna B. Carpenter was selected as the first Librarian of the Toledo Public Library. On November 3, 1873, the Toledo Public Library opened for its first day of operation on the second floor of the King Block, a commercial building on the northeast corner of Madison Avenue and Summit Street. In 1875, Miss Lucy Stevens succeeded Mrs. Carpenter as Librarian. In 1884, Stevens retired and was replaced by Mrs. Frances Jermain. In 1890, Edward O. Fallis designed a new Main Library in early Norman and Byzantine style. The final cost, including land, construction and some furniture, was $84,793. It opened on June 23, 1890. An addition was built in 1914. In 1902, Jermain retired and was replaced by Willis Fuller Sewall. He left in 1914 and was replaced by Herbert S. Hirschberg. The first full-service branch library opened in April 1915 and was at the Glenwood School. It closed with the opening of the Eliza M. Kent Branch in 1917. Other branch libraries located in schools during the 1920s included Navarre, Nathan Hale, Oakdale-White, Hamilton, McKinley, Arlington, and Harvard schools. In 1916, the Andrew Carnegie Fund offered $125,000 to build five branches on sites to be provided by city. Those branches were the David R. Locke Branch, opened on December 5, 1917; Eliza M. Kent Branch, on December 11, 1917 (fire destroyed the original building in 1974); the Anna C. Mott Branch, on January 3, 1918; Frances D. Jermain Branch, on January 7, 1918; and the South Branch, on January 16, 1918. In 1923, Carl Vitz took over as Librarian. He was succeeded in 1937 by Russell Schunk, on whose watch the current Toledo Lucas County Main Library was built. It is on land that was the former home of the Toledo Central High School. The building was designed by the architectural firm of Hahn and Hayes and opened on September 5, 1940. The interior of the building was modeled after the Enoch Pratt Free Library in Baltimore, Maryland. The exterior was modeled on that of Folger Shakespeare Library in Washington, D.C. The one of the interesting features of the building are the vitrolite murals in the Central Court and the Children's Library. On November 1, 1945, Herbert M. Sewell was named Librarian, taking over for Mr. Vitz; 10 years later, he was succeeded by Robert D. Franklin who stayed as Librarian until the merging of the 3 library systems. 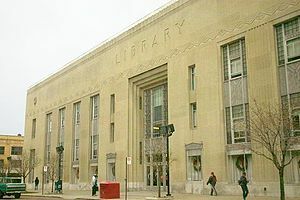 The Lucas County Library opened in 1918 at the location that is now known as the Maumee Branch of the Toledo Lucas County Public Library system. Emilie Meuser was the first Director of the Lucas County Library. She was replaced by Dorothy Strouse who served in that role from 1929-1970 when the library systems merged. In 1937 the Lucas County Library system expanded to include bookmobile service for the first time in the county. The Sylvania Public Library was established as a separate entity from the Lucas County Library in 1926 with Amy M. Ramsey as Director. Marie Huff replaced her in 1931 and served as Director until 1943 when Lillian Miller Carroll took over. Janet Boucher became Director in 1950 and was replaced in 1956 by Helen Consear who served until the systems merged. The current system was created in 1970 by the merger of the Toledo Public, Lucas County (established in 1918), and Sylvania Public (established in 1927) libraries. Lewis Naylor was named Director of the combined libraries. Ardath Danforth was named to replace him in 1977. She would leave in 1985, replaced that same year by Clyde Scoles. In 2019 Jason Kucsma became Interim Director. With passage of the 1995 levy plans began for the renovation and expansion of the Main Library. The plan was to restore the historic and add 100,000 square feet (9,300 m2) to the Art Deco facility. The architectural firm of Munger Munger + Associates Architects , Inc. designed the expansion and renovation of the building. On February 18, 1998 plans for the renovation and expansion were presented to the public, with the official ground-breaking taking place on March 8, 1998. During the project the library was able to stay open, with some temporary modifications to service points, except for the time it took to move the print and audio materials and furnishings to their new locations. The renovated and expanded Main Library reopened in August, 2001. Toledo Lucas County Public Library (TLCPL) serves all of Lucas County, which has a population of roughly 432,488. Customers frequently use the discussion groups, meeting rooms, and 170 free Internet-connected computers. TLCPL contains reference materials, including books, DVDs, and CDs. It also contains special collections such as photographs, artwork, genealogical and local history resource materials, periodicals, family histories, and obituary index to The Blade newspaper, court records, and archives from the The Blade. The Library is also a Federal Depository Library and a Patent-Trademark Depository Library. Images in Time is a collection of approximately 154,000 photographs of the Toledo area. In 2013 TLCPL received, along the public libraries of Cleveland, Cincinnati and Columbus, a grant of nearly $1 million dispersed among the four entities, funded by the Ohio Public Library Information Network (OPLIN) and the Library Services Technology Act (LSTA). The grant was for the libraries to open digitization hubs in each city in order to digitize documents, photographs and the like for local organizations and individuals. eMedia: The library offers Overdrive, RBdigital, Flipster, and many more online subscriptions. The Robert L. and Posy Huebner Collection brings together significant works of original art by illustrators of children’s literature. Established in 2004 from a generous bequest from Mr. Huebner and sustained by Mrs. Huebner, the collection blends their passion for art and their lifelong interest in educating children. This teaching collection has over 200 works of art, containing popular characters like Clifford the Big Red Dog, Fancy Nancy, and authors, such as, Dr. Seuss and many regional and award winning artists. The library also boasts a collection of artwork exhibited at the Main Library and the Branches. These artworks include "Reeds" a glass sculpture by Dale Chihuly, murals of vitrolite in the historic court and Children's Library and a large mural at the Mott Branch by artist Wil Clay titled Catch the Magic: Read. In addition, at the Main Library there are two paintings by renowned artist Edmund Osthaus. TLCPL also hosts special programs, such as its Holiday Concert series in December, the Summer Brown Bag Concert series which debuted in 1984, and the Authors! series which started in 1994, featuring well-known authors, both locally and nationally. The Main Library is located at 325 North Michigan Street in downtown Toledo, the Main Library has several departments, Computers & Media, Children's Library, Fact & Fiction, Local History & Genealogy, and the Teen Department & Studio Lab. The Children's Library at Main Library houses a creativity lab, The Susan M. Savage Family Place. The Main Library also houses the award winning Rogowski-Kaptur Labor History Room. Named for Congresswoman Marcy Kaptur's mother this room won the John Sessions Memorial Award from the American Library Association in 2014. The library has The Blade Rare Book Room featuring rare and valuable items such as a letter from Thomas Jefferson dated 1800 and first editions of the original Nancy Drew series, written by local newspaper columnist and author, Mildred Wirt Benson. Both of these rooms are located in the Local History and Genealogy Department. The library system currently has 20 branches and four Mobile Services vehicles: The locations besides Main Library are the Birmingham Branch (opened in 1920), Heatherdowns Branch (opened 1968), Holland Branch (opened 1984), Kent Branch, which also houses the Art Tatum African-American Resource Center, opened in 1917. King Road Branch (opened 2016), Lagrange Branch (opened 1934), Locke Branch (opened in 1917), Maumee Branch (former location of the Lucas County Library which opened in 1937), Mott Branch (opened in 1918, Oregon Branch (opened 1965), Mobile Services, Point Place Branch (opened 1938), Reynolds Corners Branch (opened 1958), Sanger Branch (opened 1950), South Branch (opened in 1918), Sylvania Branch (opened at its original location in 1926, opened at its current location in 1958, while still a separate entity from the Toledo Public and Lucas County Libraries), Toledo Heights Branch (opened 1935), Washington Branch (opened 1928), Waterville Branch (opened 1964), and West Toledo Branch (opened in 1923). ^ a b c d "2017 Ohio Public Library Statistics /website=Ohio.gov". Retrieved March 9, 2019. ^ "TLCPL 2017 Comprehensive Annual Financial Report /website=ToledoLibrary.org" (PDF). Retrieved March 9, 2019. ^ a b c d Noel, David (2001). Information Revolution. Donning Company Publishers. ^ Noel, David (2001). Information Revolution. Donning Company. ^ a b Anthony, Sister Mary (1942). Survey of the Toledo Public Library 1838-1942. Ohio State University. ^ a b c d http://www.toledo.com/area-directory/microsite-toledo-lucas-county-public-library/microsite/ "Toledo.com"
^ "U.S. Census Bureau QuickFacts selected: Lucas County, Ohio". www.Census.gov. Retrieved July 20, 2017. ^ "TLCPL - Images in Time". images2.toledolibrary.org. Retrieved July 17, 2018. ^ "Toledo Lucas County Public Library". www.ohiomemory.org. ^ "Ohio Digitization Hubs Project". ^ "eMedia - Toledo Lucas County Public Library". www.toledolibrary.org. ^ "Locations - Main Library - Toledo Lucas County Public Library". www.ToledoLibrary.org. Retrieved March 9, 2019. ^ "Main Library - Creativity Lab - Toledo Lucas County Public Library". www.ToledoLibrary.org. Retrieved March 9, 2019. ^ "Locations - Toledo Lucas County Public Library". www.ToledoLibrary.org. Retrieved March 9, 2019.